When we last left our heroes, they were up a creek in Annapolis, MD having escaped the buzzing of the Sailing Capitol of the U.S.A. After a peaceful night in Weems Creek, beyond the Baltimore Annapolis Boulevard Bridge, it was up and at 'em. Breakfast and coffee and hoist the anchor. This was, after all, a delivery, not a cruise. The sun languished in a purpley-pink sunrise as we got back into the bay. We were in the middle part of the Chesapeake, between Annapolis and Norfolk. The winds were against us so we were motoring. Even more ships in this part of the bay, but with so much open water it seemed like less traffic. More annoying than the ships were the fisherman. It was the weekend and we figured that they were fishing for pleasure rather than scraping the bay for a living, though there were likely some working fishermen out there too. 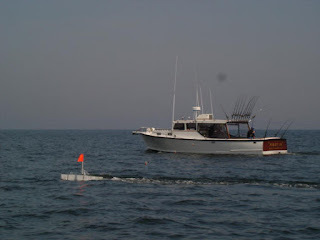 I don't know if they were fishing Rock Fish or Stripers(striped bass) but all the boats were trailing these annoying planer boards to spread out their trolling jigs. The planer boards ran out wide and behind like little toy boats. 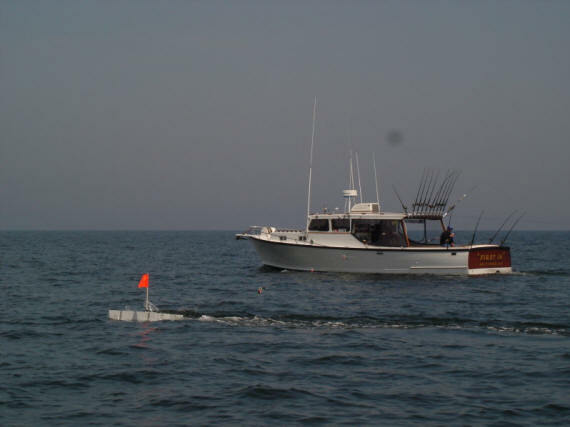 Trolling requires dragging at a particular, constant speed, back and forth over the shoals, shallows and depth contours. Apparently, the best contours are those that are right at the edge of the channel. So as we sallied our way south, fishing boats were lazily cutting in and out of the channel to cross and recross these magic spaces. As they concentrated on their specific, probably secret, speeds, depths and fishing spots, the fishermen got really uptight when we thought we had the right of way in the channel. One guy bellowed that he was going to report us for making him alter his route. At least, that's what it sounded like he said. We were a bit too far apart for communicating. Though we were motoring against the wind and not sailing, the sun was shining and the salt air, like a cool salve, soothed every spiritual cell and opened every dirty pore, sloughing away the crust of civilization. I stood on the back bench of the cockpit minding the autopilot and soaking up the universe. Every foot of boat and bowsprit spread out before me as I leaned and swayed with the rocking of the deck. It was as if I were on a forty two foot long paddleboard. We were working hard and traveling long miles each day getting Eleanor closer and closer to her new home, and yet it was so relaxing and soul enriching. I had struck this bargain, quit my job and joined this voyage exactly for moments like this. I've learned so much about sailing and about myself already that I can't imagine having not done this; having missed this … this right here. We dodged the trolls, er I mean, the trolling fishermen and apparently didn't get reported. It was a great day of voyaging. Just beyond the mouth of the Potomac River, Alex had picked out an anchorage for us. We were using Active Captain in addition to perusing the charts both on OpenCPN and on the chartplotter. Off Fleeton Point in Virginia, it looked like enough water for us to cut behind the Great Wicomico River Light and up into Ingram Bay at the mouth of the river. 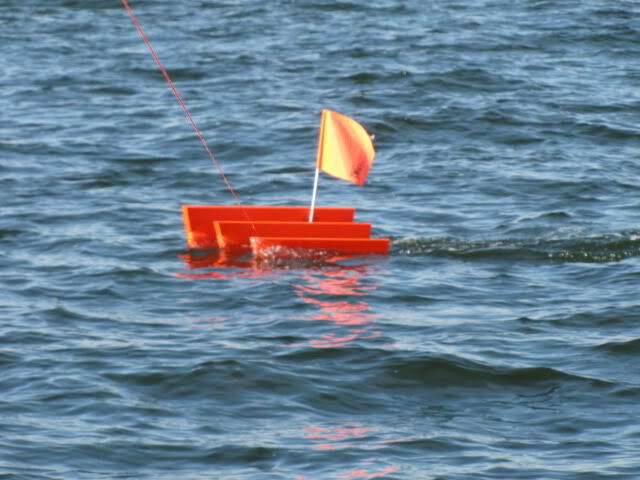 All shortcuts being equally ill conceived, we were soon surrounded by crab pot buoys and had to jump to attention. One of us at the wheel and the other amidships keeping an eye out for buoys that mark where a trap for crab or fish had been dropped. 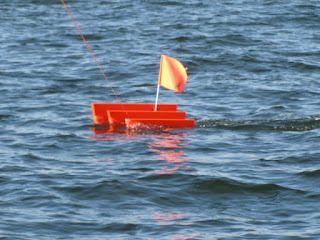 Buoys float above the trap connected by wire rope. Running over a float means getting that wire rope dangerously close to the propeller and shaft. Wrapping any line around the prop and shaft can cause serious damage to the transmission. At the very least, the engine must be shut down and the rope cut away. This is bad enough with run-of-the-mill rope or fishing line, but the uncuttable wire rope would be a disaster. Nevertheless, we made it through the maze and back into open water. At the mouth, the Great Wicomico River is a wide bay with several creeks on either side. Gradually, it narrows and turns hard to port where a large cove, like a burl on a tree branch, awaited us. Just past a nice park on the tip of yet another 'Sandy Point' and around the #9 day marker, we entered the quiet rounded cove and dropped anchor. Despite the million dollar vacation homes on the beach arcing around us, we each took a turn in the not-so-private cockpit for a bucket shower. We would make Norfolk easily the next day. 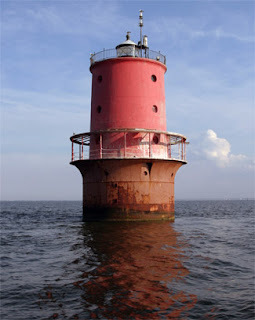 The next day was glorious as we made our way down the lower Chesapeake to the Thimble Shoals Light and turned into the Hampton Roads. It was a pleasure to pass another bridge I'd crossed a few times in a semi truck; this one with a twist. The Hampton Roads Tunnel is both a bridge and a tunnel. A long causeway leads to the tunnel entrance from the Norfolk side. The bridge ends at a little island where the road dives under the Roads to allow Navy ships uninhibited access to the Norfolk bases. Beyond the tunnel where many berths with aircraft carriers and all assortment other ships. There were yards repairing ships and lots of other activity in support of the Navy. At the confluence of the James, Nansemond and Elizabeth Rivers, we headed toward the downtowns of Norfolk and Portsmouth down the Elizabeth. 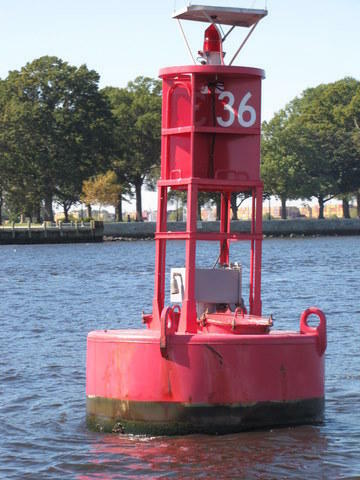 We rounded Hospital Point on the Portsmouth side and passed Red Bouy #36, the official start – mile zero – of the Intracoastal Waterway(ICW). Not only a milestone for our trip, but a stop where we were treated by one of Alex's Project Bluesphere fans. Marty had arranged for us to have two nights at the Waterside Marina, downtown Norfolk. 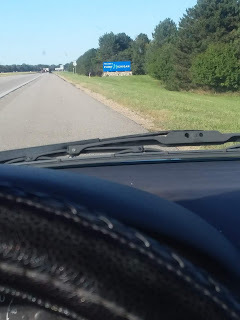 Not only that, Marty drove down from Richmond two days in a row; first to take us to lunch and arrange the berth at Waterside and the next day to grab us and go pick up Joe, Alex's father, at the airport. Joe was joining us for the trip down the ICW to Florida. But since we had arrived a day early, we motored past the Tidewater Marina to check out the free city dock at Portsmouth. We peered into the small basin as Eleanor crossed the opening. Already inside were four or five boats, snowbirds surely, and the north landing of the ferry that runs between Portsmouth and Norfolk. It looked mighty crowded to me, but Alex was game to try. I cringed as we headed deep into the basin for the last spot on an angled dock at the back. With a flawlessly executed turn to back into the corner and some help from fellow boaters to catch our dock lines, we were in for the night. Downtown Portsmouth was a delightful spot with nice restrooms at the tourist information office and a little lunch counter right across the street. We settled in for the evening. The next morning we had time to have a little breakfast and wait to cross the river to Norfolk before Marty was to arrive.